The TNT 899 is a unique motorcycle and it attracts a lot of attention for more reasons than one. 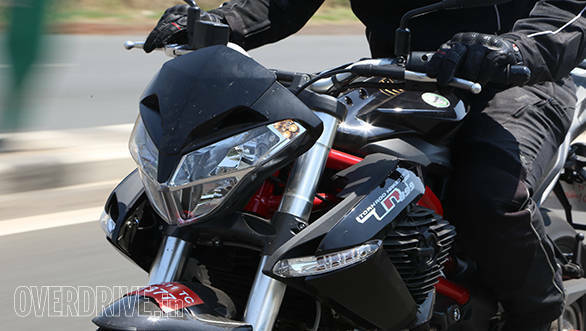 Firstly this is because of the unique insect like styling that Benelli shocked the world with when the first TNTs debuted over ten years back. 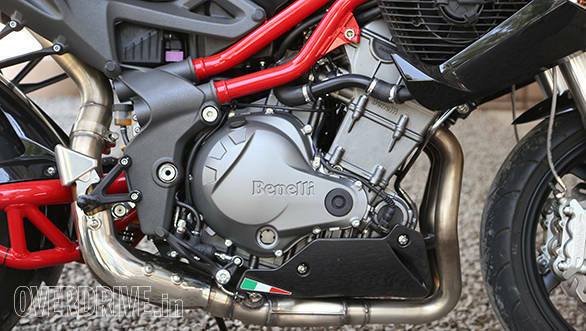 After the initial years, Benelli gently toned down the design over time to result in what we have here. Well not entirely because this Indian spec bike has a revised rear end that features grab rails and a slightly longer end can that does a remarkable job of heating said grab rails to near unusable levels (if your pillion is without gloves) after long rides. It's not a pretty motorcycle in the classic sense of the word, but it has lots of charm with the exposed red frame and tubular swing arm. However, it's not the Benelli's Italian pizzazz that turns most heads at traffic lights. No, that would be the noise. This may sound weird but the Benelli is both one of the nicest and worst sounding motorcycles I have ridden to date. I'm sure that you've spotted those big radiator fans mounted on either side of the bike and as you'd expect, they cause quite the racket. It's an unusual mix of whooshing air and a loud clatter, almost like a dry clutch rattle. It's not a very flattering noise and people hunt to see the source of the din. At which point, you blip the throttle to generate a lovely raspy snarl, which is much more what you'd expect from the likes of an in-line triple. From the word go, the TNT feels sharp and urgent but you do get the sense that the engine is held back a bit. It simply doesn't feel as frantic as you'd expect from a claimed 114PS motor. Now that figure is actually for the Indian spec bike which has been detuned from the Italian spec 120PS to handle our fuel. However the bike we rode simply didn't feel as quick as the numbers suggest. And that reflects in our tests where the Benelli took 4.69s from 0-100kmph which is actually 0.01s slower than a bog standard, India spec Triumph which we're well aware makes an ARAI certified 79PS. Food for thought. 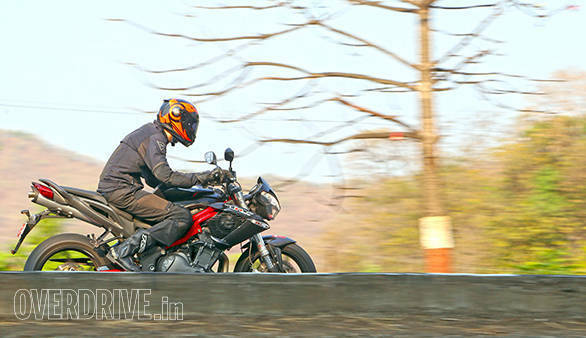 The Benelli, however, earns back quite a few brownie points when you show it a winding road. The bike, with its upside down Marzocchi forks and Sachs rear shock is a without a doubt, a firm motorcycle. But when the road begins to wind, you'll find yourself having a fantastic time. Despite the slightly high seating position, the 205kg TNT feels sharp, planted and completely in tune with the road. Braking performance is also reassuringly strong with a nice firm feel at the lever although there's no ABS. Pushing the TNT through the ghats with that intoxicating induction roar reverberating in your ears is a physical but electric experience. The TNT is a difficult motorcycle to justify as an everyday bike. It's aggressive nature coupled with that loud clatter (which I'm informed is even louder than on the pre homologation bikes) makes it a bit tedious in traffic. The motorcycle is definitely redeemed by it's thoroughly involving handling but I find its subdued power a bit of a let down. However the price doesn't do the 899 any favours unlike it's very reasonably priced four cylinder siblings. It's expensive even in relation to its very strong rivals from Triumph and Kawasaki. 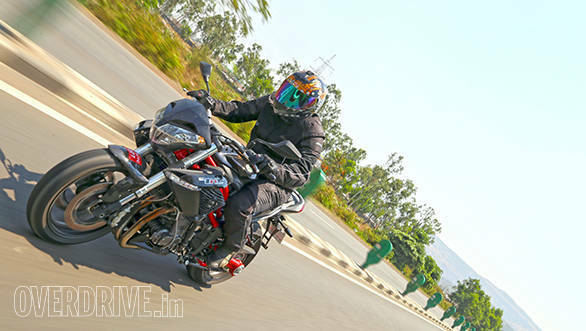 Ex-Mumbai the TNT 899 costs Rs 9.75 lakh and is Rs 1.75 lakh more than the Street Triple and also considerably dearer than the more powerful four cylinder Z800 (Rs 8.13 lakh). If it had the full punch expected from the claimed figures I'd be tempted to live with its eccentricities but the issues overwhelm the motorcycle's lovely willingness to come out and play. I don't think it is the bike for me but I could understand why someone might want to own it.